Let’s dig in to find out just who your customers are. You will need to be logged into your Google Analytics account to see this. Then click on Audience > Demographics > Overview. There you will see a breakdown of age and gender of your site visitors. Next skip down to Audience > Geo > Location. You will see a map highlighting the U.S. 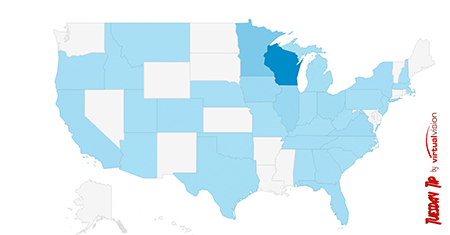 Double click on the U.S. and you will see where your audience is by state. Darker blue means more visitors. Double click again to see cities. Clicking or hovering over a highlighted area will show you the number of visits from that area. Now you know where you can concentrate your advertising dollars. However, robots in other countries, such as Russia, can skew the results. Virtual Vision filters out known robots, but keep in mind that high numbers in other countries aren’t all true. Next click on Audience > Mobile > Overview. Here you will see the breakdown of users by desktop, mobile, and tablet. You can use your judgment with these results. A lot of users on desktop might mean that people are more likely to visit from their work computer, your visitors might be older and don’t have smartphones, or your site doesn’t work well on a phone screen. Are your customers located where you expected? Do you see the potential to grow in another area? Virtual Vision is here to help.